My Dear, my skype id is: amandine.philippe6, pls add me so we can chat video, well I decided To contact you for assisting me as a foreign business relation to my late Father., My Name, is Amandine Philippe, my fathers name is Chef. 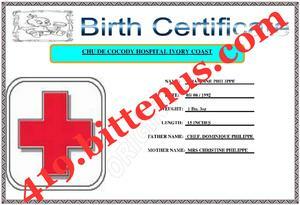 Dominique Philippe, he was a very wealthy gold and cocoa Merchant who based in ABIDJAN respectively, and my mother's name Is Christiana Philippe And I am their only Child. when I was a kid I went to a private Schools and things was going on well for me and my parents until when I was in High school when my mother died, my father took me So special because I am motherless. And he showers all his love on me. but after my father death last year. on the 12th March 2015 in a private hospital here in Abidjan, he Called me secretly to his bed side and told me that he deposited the sum of 1.8 Million Dollars in one bank here in Abidjan the Capital city of my country Cote d'Ivoire for investment purposes. He also explained to me that it was because of this money he was poisoned by His business partner and that I should seek for foreign partner in a country of My choice where I would investment this money if it happens that I could not see Him any more. Please, I am honourably soliciting your kind assistance as follows. 1) To assist me and stand as my father's foreign business relation to get this money transferred to you for investment purposes to your country. 2) To serve as the guardian of this fund, since I am too small to handle such Amount. 3) To make arrangement for me in your country to continue my educational career And to procure me a Residential permit in your country. For the fact that we are not yet familiar with each other or have seen face to face before. I am just confiding this project on you due to the circumstance surrounding my family life after the death of my late father. See my dear I lost my father whom was very dear to me, for this fact I have reposed this hope and confidence on you with open mind that you will be capable to receive this funds over there and invest it properly with your care as I have the intention of furthering my academical career by admitting into medical school over there, when I come over to your place with your guardian and supervision. Am in really in need of relocating from this country and I needed an assistance of trust worthy and a young person who will not let me down of any kind this confidence. Only just to assist me in investing this sum of One Million Eight Hundred Thousand United State Dollars. ($1,800 000 00) in a profitable investment for the benefits of both parties, in the areas like, agricultural in put, hotel resort management, real estate housing project, manufacturing, stock market Etc in what ever avenue you deem right is profitable, since I have not yet be into business before. I want you to be rest assured that there is nothing to fear about in this transaction because there will not be any illegality or any strange protocols of any kind to be attached on this transaction as it is legitimately acquired money by my late father whom died for no just cause with an instigation of one of my wicked uncle whom I later found out that he was the person who mastermind the death of my father, since then I left our family house. Do kindly indicate your full interest to handle this transaction with out any negative sentiments by sending to me, your complete names, A copy of your identification card or passport, your Address and your mob phone number, to enable me recognize you easily on my arrival in your base. Quite frankly I know it may have sounded pretty strange for you on why I choose to contact you who are a complete stranger to me although not anymore, because we re now like family and good friend, and I must tell you this, I contacted you for the simple reason that we do not know each other before. It would be very difficult for me to contact anybody here who knows me for this purpose as I may stand the risk and chance of being cheated of my money because the person would have known my weaknesses. I may even lose my life on the long run but this is an exact opposite on contacting a complete stranger. I have always known that it would be very difficult if not totally impossible for someone who does not know me to try to hurt me over my inheritance hence, I contacted you. I believed in my heart that you will not fail me nor try to do anything funny and your mail to me now has reconfirmed what I had believed earlier. This is in addition to the fact that my father advised me in his dying bed to ensure that I had a foreigner assist me with this venture instead of having any of our local people do it for me. I guess he knows pretty well the ways of life of our people and didn't want me to go through the agonies he faced while having our local people as his business partners. You see the fact remains that the amount in question is my inheritance from my late father. Like I did explain in my earlier email to you; my Dad deposited the fund with a bank here in Cote d'Ivoire where I am still staying and writing you from now; with the utmost intentions of having it transferred overseas for investment but was killed primarily because of jealousy. They felt he was going to use his wealth to monopolies their business hence got him poisoned. Cote d'Ivoire is the world's largest producers and exporters of cocoa and coffee and it's a very lucrative business here. However, during the time of the fund's deposit, my father had a documented agreement with the bank that in the event of an uncertainty (death) I should not be allowed to have a direct access to the fund, in the same agreement, it stated that in the event that I want to have access to the funds, I must have a guardian/partner who must be of a foreign origin. Please send to me your full names, your address, telephone number, id card or passport, Once I received them i shall go to submit your information to the bank for the next step to take. Dear, I am writing to inform you that I have completed the arrangement for the transfer with the bank and The Foreign Remittance Manager Dr. Mustapha Idris, have assured me that they will be willing to release the money into your Bank account but that shall be done in legal procedure as require from the bank rules. You also know that It is very important we put pressure to the bank management to release the money if not they will be holding on the money because they are trading with it and my father is no longer alive, so I need to fight to recover this asset. Please I need your maximum co-operation. I have the honour to inform you that the request sent to the executive board members of the bank have been approved after a meeting today dated 05/01/2016. The executive board members unanimously accepted and have given their consent to the request instructing the remittance department to proceed with the international transfer process and transfer the amount 1.800.000.000million USD into any of your choice and donated bank account anywhere. Therefore, upon the receipt of this notification, you are expected to follow up our simple instruction to enable us complete the transfer process and transfer the money into your bank account. We have notified your partner Miss. 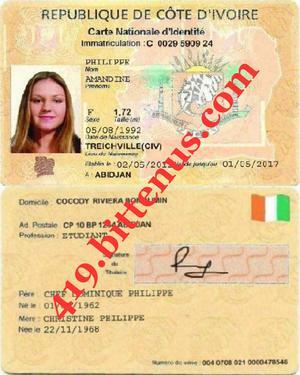 Amandine Philippe, that all correspondence concerning this transaction would be made directly to you from now. 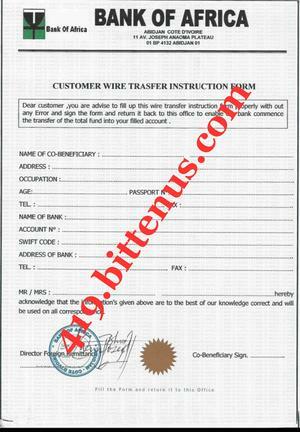 Since she has appointed you the guardian, we will deal directly with you and will transfer to the money only to you. Thanking you for your understanding and co-operation. Many thanks for the urgent request sent to this office through BANK OF AFRICA CI. of assisting you get the three legal documents from the court of justice here, we have gone through the content of your email request and we are glad to inform you that we are able and willing to assist you as regards to endorse the propose legal documents that will authorize the release of Miss.Amandine Philippe, funds into any of your Nominated Bank account without any problems. As financial attorneys, we are willing and able to represent you on all financial matters here in the Côte d'Ivoire. We assure you of our experience professional services. 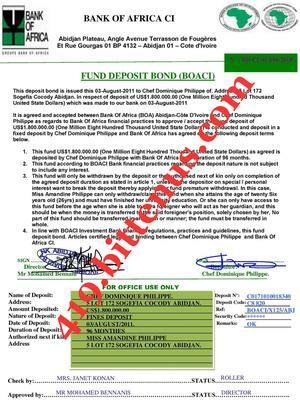 Furthermore, having understood the content of your request, we want to assure you that we will follow up the transfer procedure and secure all relevant Legal documents at the Court of Justice here in Côte d'Ivoire that will authorize the Bank to transfer the funds to your account without problems. 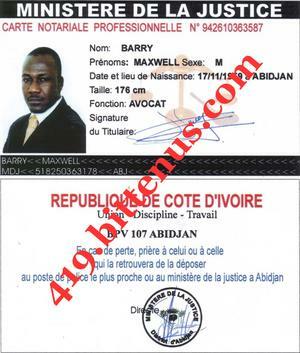 Address: 01 BP 4132, Abidjan 01- Côte d'Ivoire. Once we receive our Consultation and Legal Fees within (24/hours) I shall further complete the procedure of having the documents delivered to the Bank. 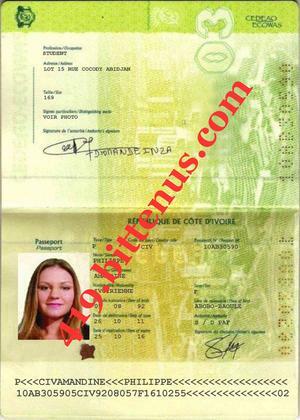 It is also important to inform you that without the Fees, 1.750 USD none of these documents can be obtain. With the hope my position is made clear, I await your immediate response. 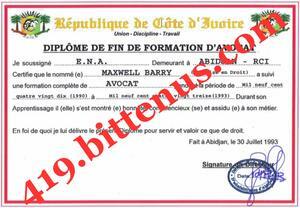 I, Mr. , do hereby authorize Barrister Maxwell Barry, of (Maxwell Barry & Co Chambers) to represent me on all matters concerning the release of Miss.Amandine Philippe. 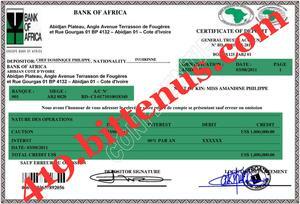 funds Amounting US$1.8m (One Million Eight Hundred Thousand United States Dollars) with Bank of Africa, Abidjan Cote d'Ivoire and as well secure all other Legal documents relating to the funds transfer. I hereby make this declaration in good faith and due understanding of English language and in accordance with the Financial Act of 1999 of the United Kingdom & Wales. The lawyer indicated that this sum must be paid cash to the government treasury here, before the documents can be established, which a receipt will be given to him, with the receipt he can then meet with the administrative sections of the Ministry of Justice department for swearing of affidavit of oath on your behalf as the new beneficiary etc. I was pleading with the lawyer for more than two hours that I left the House, pleading with him to help us bear the cost of the papers and get the documents prepared, so that after I will settle him nicely with some good commission. but he said no that it is not done so, because the fee is not going into his pocket but that it is government official levy that is going into the treasury of the Ministry of Justice. The lawyer made me to know that these type of documents is very important in this kind inherited asset recovery release, because it will enable the bank to record that me, as the rightful next of kin, to such asset deposit have officially withdrawn my inherited treasure officially to you as the new beneficiary for record and reference purposes in future. And that these legal papers will help you as the receiver of the funds, when it gets into your account to prevent any inquiry from the authorities in your country, who might want to investigate the origin source of the funds when it arrives into your account over there you will present the legal papers as prove to avoid any kind of embarrassment from government over there. The lawyer said the papers is going to serve as prove of the origin source of the money, when it reflect into your bank account over there. that Any security agents over there who might want to know the source origin of the fund, when the money reflect into your account, you will show them the documents as the prove of legitimate of origin of the funds, so the three papers is very vital in this refund process the lawyer said. I have also explained this development to the bank director Dr. Mustapha Idris, the situation of things, concerning the cost required by the lawyer for issuing these papers. But the bank director made me to understand that the reasons why the authorities here have made it mandatory that all beneficiaries with this type of inheritance must undergo the process of obtaining these legal papers by the efforts of the benefactor. The bank director said that their banks have been having problems with the extended families members and next of kin of most of their trustee when they die suddenly. He said that most a times after they might have released the inherited asset to the rightful next of kin in, sometime in future along the line some other group will appear from the same family linage and start making second claims of the asset the bank have already released to rightful next of kin. So the authorities here have made it compulsory that the processes of obtaining these documents must be done by the efforts of the next kin inheritor, beneficiary with his or her hand sign in court. So that the bank will be clear of any accusation in future if there may be any, of which I am very sure that there will not be any second claim in future because I am the rightful next kin to the deposit. The bank director insisted that the rules of the bank is that these papers must to be obtained with the efforts of the inheritor, then submit to them for the release order permission to be issue from their board, before the transfer could be conducted into the account you shall provide in the Bank Form. I have tried all what I can to convince the bank in giving some loan or helping hand in obtaining these documents. But the bank director said that it is not done so that we must obtain these documents by own efforts. That it is the bank rules according to the agreement on the type of deposit my late Father made. I am very worried and confused now as I do not know what to do because as a student; I am not having the total cash to get the documents done. I have only 1000 US Dollars with me and I have giving it to the lawyer to start the process. And that is the only cash I have at hand which I have been using for my feeding. Pending the payment of the rest balance of 750 US Dollars will be made as the lawyer insisted that we must pay before under going the process of which I do not know how to find now as a student things are really not easy for me here. Please I want you to kindly find one way or the order to send to the lawyer, the rest balance fee of 750 US Dollars for quick preparation of the legal papers, which will bear your name as the new beneficiary as it is government fee that we are in obligation to pay. Please my dear do not say no to me, just try to support me on this crucial stage. I assure you that I will never let you down of any kind. I urge you to help me by sending the rest fee 750 dollars to the lawyer, in order to enable him make the complete payment to the government and get these documents establish and submit to the bank for the transfer to commence immediately into your account as we agreed. However, it is not as if you supposed to spend your money when I needed your assistance but to facilitate this project kindly help me to send if it is possible today for quick process. so that the lawyer can get these documents finalize and submit to the bank for this transfer into your account, as the court clerk is expecting for the whole fees to get the documents issued. Also try and fill up the Bank form and send to the Bank and a copy to the lawyer as the Bank demanded, The bank director assured me that if we obtain the documents and submit to them they will release the money from the bond and conduct the transfer at the same time. Please let me know your decision regarding to this matter, based on sending to the lawyer rest fee 750 Dollars to complete the process.